Yes, you can use your own cascading style sheet (CSS) to customize the look of your contact form. Styling forms with CSS is a great opportunity to add your company’s brand on the form, not to mention it offers a lot of flexibility during creation. Styling forms with CSS is quite simple on 123FormBuilder. 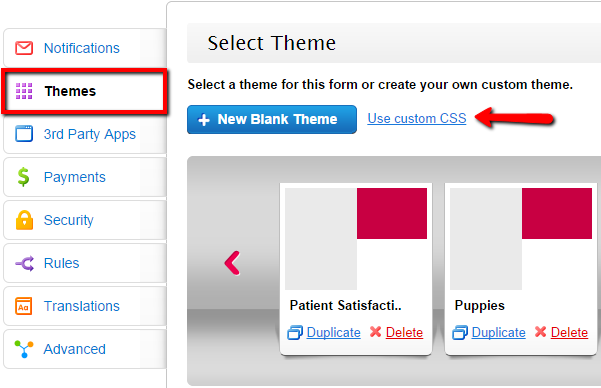 You have to paste the code or enter the URL to the CSS file in Settings → Themes → Use custom CSS. Once you have pressed Apply (in the lightbox), the changes will automatically take effect on your form. Hit Preview or View to see the results. Learn about Full CSS Form Customization.